When I first wrote this post back in 2011, Queensland had too much water, but usually water is very precious to us. Being in a rural area, we rely on our own rainwater supplies for drinking water and septic to treat our sewerage. I’m quite happy with that arrangement, as it means we don’t have to drink the unnecessary levels of fluoride and chlorine in town water. It also means that we have to ration our own water supply when the weather is dry and consider everything that we put down the drain. I feel sorry for people in the city having water rationing forced on them through water restrictions, we just have to be responsible for our own use. The funniest thing is that my first reaction now when it rains is to put on several loads of washing so that the water isn’t wasted by running out of our full tanks (luckily we have plenty of space on the verandah to hang it to dry). 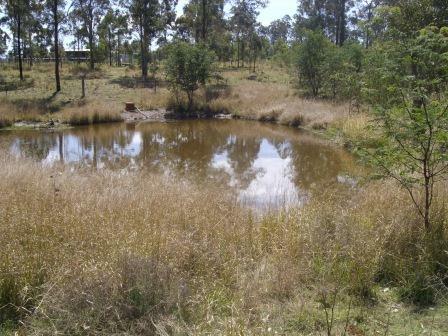 At our previous property we also had two large dams. We used the water from the dams for the steers, the chickens and on the garden. 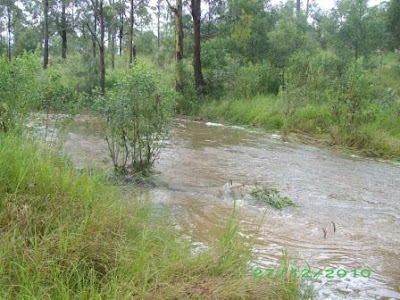 When we moved to Nanango, we found out that our dam was saline (our neighbour told us a few hours after we moved in!). We used a salt meter to check the salt concentration, and its too high for chickens or the garden, but ok for the cattle (read more about testing water quality here). This meant that we had to rethink our water strategy. We have more water tanks at the new house, so there was plenty to share with the chickens, but there wasn’t enough for the garden. At first I emptied buckets of bath water onto my garden of pots of herbs that I rescued before we moved. Then Pete decided to build something more permanent. Our old house had a grey water system, but we never used it much apart from moving the hose around the lawn so it didn’t create a bog. We’re not really supposed to use greywater on gardens in Queensland these days (the other system was old), so I won’t go into too much detail here. Basically all bath and washing machine water goes into a tank that I pump out to the garden in the afternoons. As far as I know, the main reason that this isn’t allowed is that there is the potential for people to get sick from eating veges when greywater is used for irrigation if there are pathogens in the water. As we are aware of this issue, we are very careful to wash all veges thoroughly before eating, especially any that aren’t cooked (mostly only lettuce), and we only use bath and washing machine water, so its reasonably dilute (no kitchen waste water). We have been doing this for a year and haven’t got sick from it yet. I can’t see a major risk as I put manure tea on the garden anyway, so surely that is just as likely to make us sick! but ok for the cattle to drink. The other reason that grey water isn't recommended is that salts in the water can build up in the soil. For this reason I'm very careful about the soap we use in the bath and the laundry. We only use organic products and laundry detergent that's certified for grey water systems. Luckily we get plenty of rain when its hot, so the garden gets a good flush out when it needs water, and less rain when its cold, but I don't have to water as much then anyway as evaporation is lower. I hope that topping up the garden with compost, manure and mulch is enough to prevent accumulation of salts. 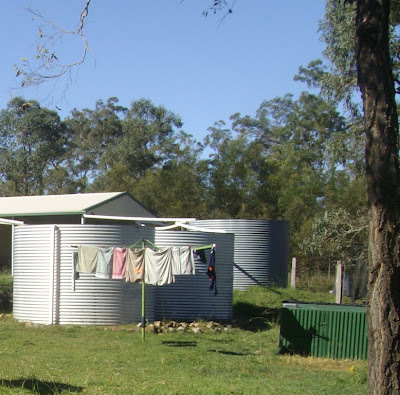 For the house, we have three tanks about 20,000 L each, which are filled from run-off from the shed and the house. This is plenty for two people and they often overflow. If you need to estimate how many tanks you will need, consider how much water you will use (some estimates are 300 L/day, but I think you find that you use much less when you are paying for it directly, read more about our water conservation measures here), then work out the size of your catchment area and your average monthly rainfall. You can then estimate how much water you will harvest each month and how much you will use, and work out what buffer you will need in the form of tanks. Catching rainwater in tanks is by far the cheapest way to get more water, compared to digging a dam or a bore, so the more tanks you can afford to install, the better. In 2014 we decided to replace two of the leaking metal water tanks pictured above with plastic tanks. See this post about moving the tanks around the yard. I wasn't convinced about getting plastic tanks (as we try not to drink out of plastic drink bottles), but the other options are not great either. Concrete tanks always end up leaking, as to the metal tanks, unless they have a plastic liner. After the tanks were installed I realised that the water was low pH and we had to add some limestone to neutralise the water (it was previously buffered by the rusting metal). Overall, this means we’re responsible for both our drinking water and our waste water. If we stuff up, we have to pay, either buying water or having the septic pumped out, but I like to know that we are self-sufficient and can manage it all ourselves, without relying on the government or local council to tell us what we can and can't do. Are you self-sufficient for water on your property? Yes and no Liz. We have a couple of tanks and one dam. 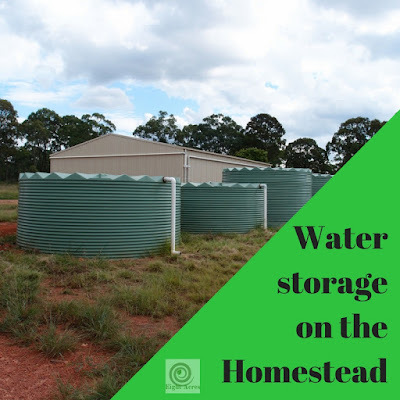 So yes we are water self-sufficient, but no because we still need more water storage. 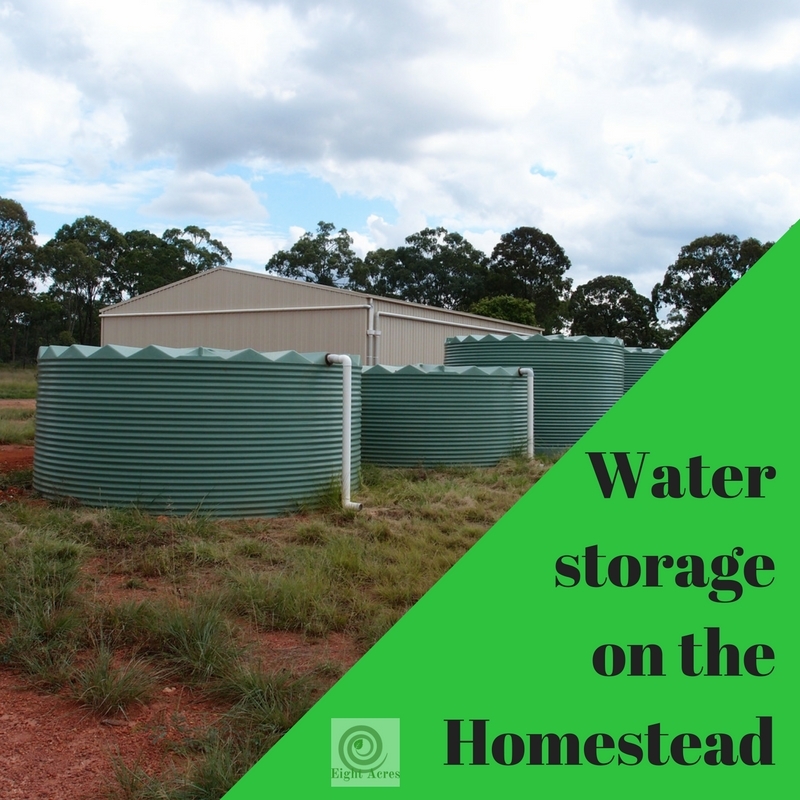 Increasing our water storage is on our permaculture property plan. Our neighbour's dam is spring fed and I have water envy. Hi Liz, I thought we were pretty ok, but we lost our windmill a few months ago in a storm and have had to buy in water twice. Although the cost was not completely ridiculous, its not something I'd like to have to do regularly. Fortunately we have now replaced the windmill so, we're back in business. A lot of people are going with solar instead of windmills now, because they are easier to maintain, glad you got yours fixed! Re the saline dam. On purchase of a property would you normally have the dam and or well tested? When we bought this property we didn't know to test the water. Now we know, and when we purchased Cheslyn Rise we went to every dam with our conductivity meter and checked the water! We could have added more testing to the contract if we needed to send it away, I would do that for bigger irrigation properties with bores. If its an important part of the property then you should absolutely test as much as you can so you know what you're really getting. I had the same question as Janine re the testing! Yes, that is a problem with catching rainwater in the city. Fortunately you can get some good filtration systems now. We have two particulate filters on our drinking water at the moment, and I'm looking at adding carbon filters for our new kitchen just to make sure we get everything out. I'll write more about that soon. I'll look forward to your post on filters! We filter our drinking water, I believe it removes everything...and we're just about to filter our bathing water too as my mum is getting us a filter for the chlorine. Still working on water supplies here. I'd like to get some tanks up higher (we certainly have the slope for it) so we can use gravity to feed water lower down. Yes gravity feed is ideal, with solar pumps to fill the tank :) then you will always have pressure when you need it. Our tanks are plumbed into the laundry and the bathroom/toilet, so that reduces the water bill. I remember as a kid taking 1 inch baths then using the bath water to flush the loo with a bucket - it was drought. This is a really interesting post Liz. We have installed five 22,000 litre tanks since we moved here twelve years ago. Three to start with and then another two after our plans to sink a bore were refused by council. Mains water line runs past our property and we are connected should we require it. Our tanks have only the winter rains time to fill up, and last year they didn't get anywhere near full, so we had to use mains for most of summer. But this has been a wet year for us, all the tanks are full, and we should almost get right through summer on tank water. We use it for everything; the house, the gardens and the stock troughs in the paddocks, assisted by electric pumps. I think our water bills will be non existent this 12 months, apart from the basic quarterly service fee for the mains connection that we have to pay whether we use any water or not. The cost of mains water has been rapidly increasing here, so we make a big saving by having tank water. I didn't know about testing for ph though, so will get that done. We have a filter on the pump that enters the house, plus another under sink filter for drinking water. We've heard of people being unwell, and have finally discovered after long periods of time that their rain water has contained parasites.